Dear Teacher, I love you. Sincerely, Niel Ahn, your student. This time, I present to you a TEEN TOP story. Sorry for the people that wanted me to write a L. Joe fic, but when I thought of this plot, I thought that this member would suit the protagonist more. *BTW the pics and gifs I use in this story, or any of my stories, are not mine! Credit to those who make them! I know you get tired of the same message, but I get tired of plagiarizing issues. PLEASE DO NOT IN ANY WAY, SHAPE, OR FORM COPY MY STORIES! THAT MEANS NO COPYING, NO PLAGIARIZING, NO SAVING ON YOUR TECHNOLOGIES, NO PRINTING, NO REPOSTING, NO TRANSLATING, ETC. ALSO DO NOT ASK ME FOR COPIES OF MY STORIES. I CANNOT SEND THEM TO YOU, NO MATTER WHAT THE CIRCUMSTANCES ARE! I work hard on my stories, and it gets discouraging when people steal them from me. It may be unfair since some of you want copies of my stories for personal reasons, but honestly, online, I can't tell who really needs copies or who is using that as an excuse to copy my story. So please be respectful, and do not copy my stories in any way. Sohee is an intelligent history major who graduated from Seoul National University. Her occupation currently is a high school teacher. She is a strict instructor who does not tolerate any crap from her students. She may seem like an uptight prude, but deep inside, she cares a lot for her students. Daniel, as known as Niel to his friends and classmates, is a troublemaker. He is a senior at the infamous boys' school in downtown Seoul: Goryo High School for Boys. The last thing he cares about is grades. The only thing he cares about is having fun. Niel has a reputation for being a skilled fighter. He does not lose his temper easily, but when he does, the people around him will have to watch out since his wrath could target anyone in the area. He can be mysterious, silent, and frightening, but he also has a sharp tongue and witty comebacks with eyes that taunt his enemies. He will let no one get the best of him, not even authorities like high school teachers. Niel's friends, and the gang that rules downtown Seoul. Jang Sohee resigns her position as a history teacher at the prestigious Hansung Elite Academy and transfers to a wrecked high school for boys that is infamous for its troublemakers. She wanted to make a difference in students' lives who don't have the same opportunities as students with rich parents and multi-billionaire mansions do. Little does she know, she will run into her fate and destiny. When she crosses pass with the notorious, cold-hearted Niel, she is presented with a challenge to raise his grades and change his heart. Sohee has never failed in teaching a student before. However, when she meets Daniel Ahn, she knows there is something different about him. Will she be able to help him become a successful man in life? If Niel gives into her, is it because she is a good teacher, or the woman he loves? 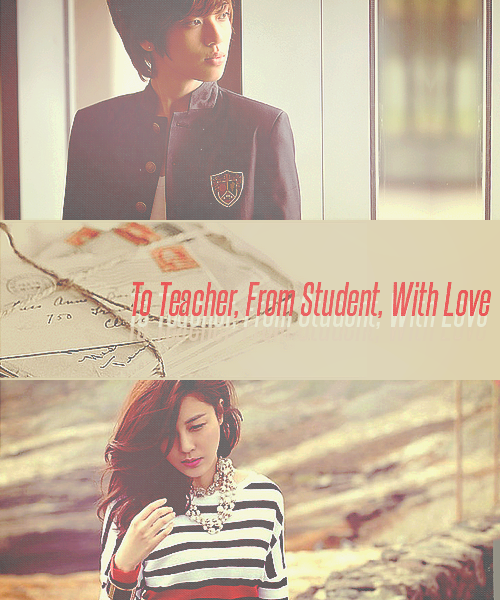 Read to find out the prohibited love journey between a teacher and her student. Belongs to DBSKGIRL4EVER 2012. All rights reserved. No printing or redistribution allowed. Do not post anywhere else. Do not plagiarize. Do not download. No form of copying or saving allowed. Do not translate. Do not take ideas, dialogues, and others from my story! ESP without permission! Please don't plagiarize and any ideas, dialogues, and others that has to do with my story need to be given permission by me and credited by you IF I allow it. Any violations will be reported and immediate action will be taken! 41 Do you care about me? 47 Can I be your roommate?